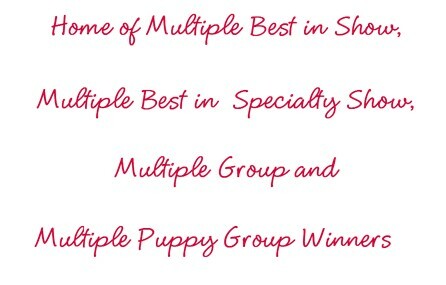 Due to an injury I sustained a few years ago we will be showing & breeding on a very limited basis.. The Yorkshire Terrier hails from Northern England where he had the job of keeping down the rat population in coal pits and cotton mills. He was also used to compete in rat-killing contests. The original Yorkie was twice the weight of today's terrier, but since he has been bred down in size, the Yorkshire has become the most popular Toy breed in England and one of the most popular around the world. One of the world's smallest & most popular breed of dogs, the Yorkie today generally weighs no more than 7 pounds***. His long, straight, silky coat is believed to be inherited from Maltese ancestors. All puppies are born almost black and most will lighten to a steel-blue gray by the time they are twelve months old, while some will remain black. The Yorkie has a tan-colored head and legs. Daily brushing is required. Tiny but tough, the Yorkshire Terrier has been described as 'a big dog personality in a small dog body'. He will make an alert watchdog. As a true terrier, the Yorkie is lively, brave, and spirited. Although he is affectionate and cheerful in disposition, the Yorkie, like many smaller dogs, does not tolerate roughhousing and therefore makes an unsuitable pet for people with young children. His small size makes him an ideal companion in even the smallest accommodations. Although his activity level is high, running around the house should provide enough exercise, making him the perfect pet for those who stay-at-home. He is a fast learner and easily trained. Like most other terriers, he will benefit from early obedience training and socialization and will excel at both. 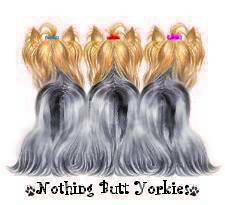 *** (There is only 1 breed of Yorkie and it is called the Yorkshire Terrier - there is no such thing as a 'Toy Yorkie' , 'Teacup Yorkie', etc. Many 'breeders' try to capitalize on the size some Yorkies attain by calling them 'teacup' or `pocket'. Tinier Yorkies, generally those who will reach no more than 4 lbs, should always be considered 'pet quality' and not be used for reproduction. Squirrel Yorkies will never use terms such as 'teacup' or 'pocket' and will always endeavor to be as accurate as possible in determining the adult size of all it's Yorkies). 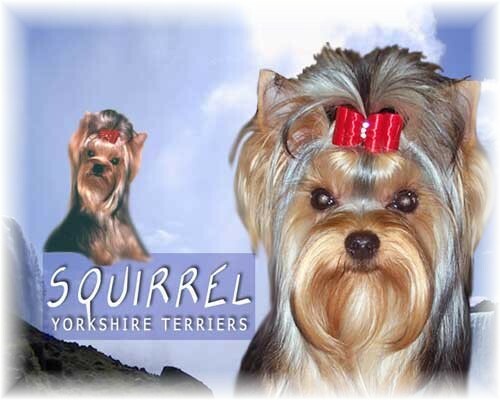 Become a FAN of Squirrel Yorkies on Facebook! 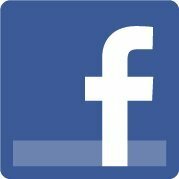 Click the link above to be taken to our FB page. We use & highly recommend the IRIS cage - it's lightweight, versatile and affordable! Copyright Squirrel Yorkies 1986 - 2016. All rights reserved.